Although I never knew her, outside of seeing her blog posts and lovely mandalas, I was still very sad to see the news about Wink at A Creative Being. 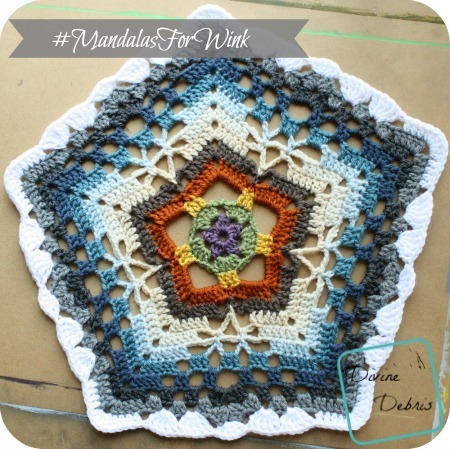 I don’t know what to say, except, that it’s beautiful to watch the response from the crochet community, with the hashtag #MandalasforWink on IG, and the many touching posts on FB. I, for one, wish I knew her better. She must have been a lovely person to garner this outpouring of love. As someone else who also struggles with depression, this support is on a whole other level. If you or someone you know is struggling with depression, there are help lines available 24/7: SuicidePreventionLifeline.Org. Please, do not hesitate to ask for help. This pattern is worked in the round with the last st being slip stitched to the first st. The dc3tog (and dc2tog) at the beginning is a cluster st, you’re not actually decreasing. Each row is a different color, although that’s not expressed in the pattern. Beginning with standing DC helps to make the mandala seamless. If you don’t want a slip st marring the beautiful finished piece, fasten off after every row and use the invisible join technique before moving onto the next one. It will make it nearly impossible for anyone to spot your join/ seam. Each row begins where the previous one left off, before the dcs on the point. So, there it is. 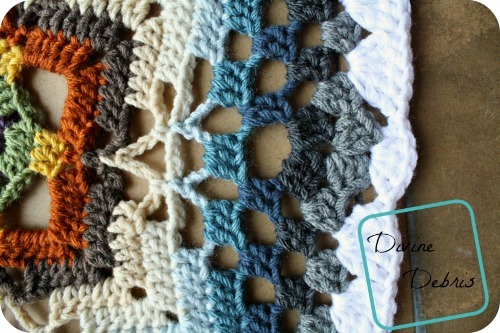 My heart is sad for the loss of such a talented and much loved crocheter and person. I’ve seen, first hand from losing friends and family, what this sort of loss feels like. My heart goes out to her family and close friends. 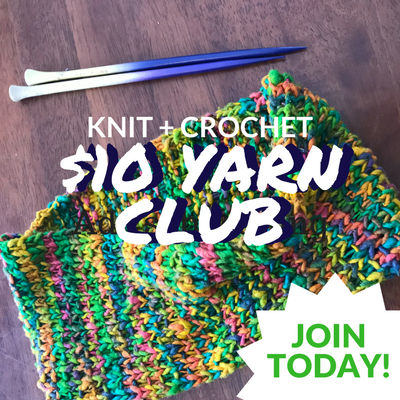 This post is linked up to The Purple Poncho’s Linky Ladies Community Link Pary #6, Oui Crochet Fiber Tuesdays #16, Oombawka Design’s Link and Share Wednesdays #99, Lunamon Design’s 2 Day Link Party #27, and GSHeller’s Yarn Along #234. This is Uma from India. 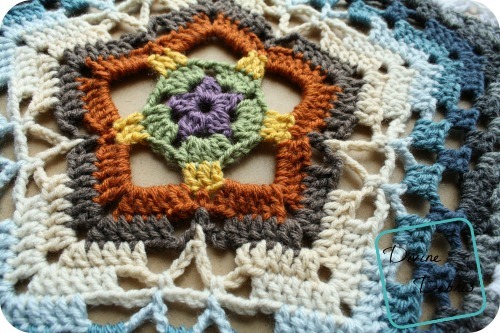 I am working right now on this mandala.Very beautiful pattern I have ever seen.But…. I am stuck up on Row 11. See as you have mentioned after 2 dc in 3ch space we have to make first 3 ch then 2 dc in next ch space .again 3 ch ,again 2 dc ,then 5 ch and 2 dc,3ch and 2dc and……….then you have written skip 3 dcs and 3dc in next 3dcs..You mean to say it will be like 2dc-3ch-2dc-3ch-2dc-5ch-2dc-3ch-skip 3dcs and 3dcs in next??? I think problem is here . it is going wrong..what I thought is after every 2dcs chain sequence should be like 3-3-5-3-3.. Thank you for the changes you made!! What a beautiful pattern. Thank you for creating it and dedicating it to Marinke. I really enjoyed making this. 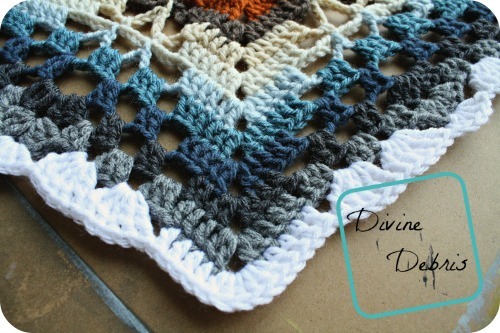 The pattern was well written and easy to follow and it was nice to make something in a different shape. I think penragons should be more popular! This is beautiful! 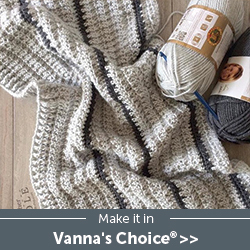 Can’t wait to try it out 🙂 Thank you for sharing your pattern! Congratulations for being #2 at my link up last week. I’m just one more who was so inspired by Wink’s designs her use of color and her beautiful designs! I’d read her story on Crochet Concupiscence and was inspired by her reasons for crochet = as I suffer severe back problems and chronic pain. I’ve always been a “Type A” and had to keep busy all the time…until my injury slapped me down and kept me from physical activity a large part of every day….I found crochet also helped immensely – because I could be seated (or reclined as the case may be) and still keep busy with crochet and accomplish something at the same time…Wink INSPIRED me to do that – and her her help and that of other wonderful online bloggers, I’ve done LOTS of crochet. I am shocked and saddened by her loss – and my heart – and my prayers go out to her family and all who knew her. I hope they can take some solace in knowing how much she helped others! This is beautiful…and I, too, have never seen a Pentagon Mandala….very different – I think Wink would approve! So happy to see how many are doing Mandalas for Wink in her memory! Thank you for sharing your story with me. I think that’s what grabs people about Wink’s story, it was so relatable to everyone on some level. I didn’t know her but I do understand the struggle of feeling so weighed down by depression that you feel like you’re being subjected to the whims of someone else. Her loss can be felt but I do hope it encourages others to seek help if they find themselves in a similar situation. Thank you for stopping by and I hope you create a pentagon mandala and think of Wink and all those like her. I too struggle with severe depression, which resulted in self harming. I have been on numerous medications which only made it worse or left me in state where i could not function normally. I have to rely 100% on my husband and family. I used to draw to vent some of my feelings but, i also have essential tremors. My entire body shakes constantly and has robbed me of that outlet. I now focus all my attention to crocheting now. I am very very thankful for the endless support of my family and thier ability to recognize small changes in my body language. I wish more could be done for those of us who fight the daily battle, instead of it being blown off as someone just seeking attention. 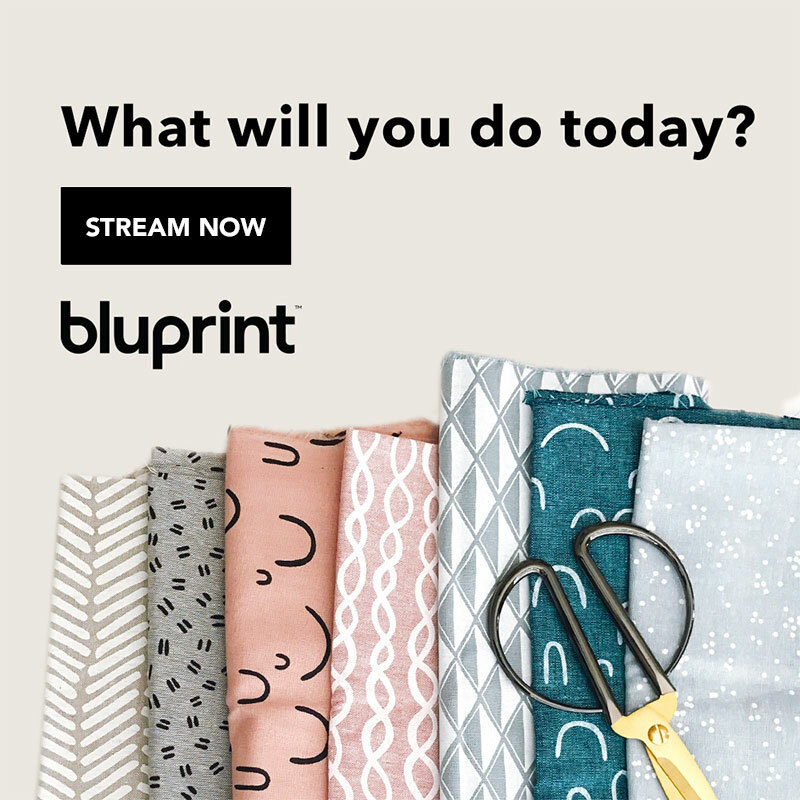 My question is… can this pattern be continued on to make it larger? Or would it be best to do as blocked and sewn together. I cannot believe it's been almost 2 years since I made this post.